The holiday season is quickly approaching. With Thanksgiving, Black Friday, Small Business Saturday, Cyber Monday, Hanukkah, Christmas, and New Years’ all on the horizon, consumers are more concerned with where they can get a deal than any other time of the year. For businesses, not just in retail, this is the perfect chance to take advantage of the fact that consumers are actually looking at advertisements, in mail and digital formats. Many companies have already caught on to that simple fact, as data shows there’s an increase in mail volume in quarter three (Q3) and especially quarter four (Q4). Q3 and Q4 have the highest engagement and response rates in all areas of marketing. Most businesses utilize the holiday season as the season to send out multiple direct mail campaigns, social media statuses/shares, and emails; increasing the competition among businesses in the same industry. It’s important to stay in the game and be one step ahead of your competition. So how exactly do you go about planning your direct marketing campaigns for the holiday season? We’ve got you covered. It’s very important to know your target audience of shoppers so that you know who to gear the sales and subsequent marketing message towards. You should be collecting data year round so that by the holiday season you have an accurate read on your consumers. Once you know who these people are, you have to now interact with them across various channels, spanning direct marketing all the way to paid and social. This will also help you draw conclusions on the types of customers who are reacting to your marketing message so that you know which campaigns to use when the time comes (Trellis). You should be prepared for shoppers of all different shopping tendencies. Meaning you should start your sales and advertising early enough for early Christmas shoppers, continue them through for the Black Friday shoppers, and make sure you have enough products in stock that could be delivered on time for those last minute shoppers. You should not be heading into the holiday season without at least having tested the waters. “To get a head start on the holidays, marketers should promote ads weeks in advance of the shopping season. Doing so gives them ample opportunity to try new copy and images to learn how consumers react. With enough lead time, they can optimize their creatives to guarantee profitable performance when it’s go-time. By promoting your holiday sale early, you get first-mover advantage. This helps you prime buyers to choose you as their default shopping destination for the holidays,” (Entrepreneur). Not only does this allow you to test out your ideas, offers, and copy – it allows you to manage your budget and spend it on a proven method rather than a concept. No one is saying to start talking about your holiday deals in May, but by the end of the third quarter (October), you should at least have a timeline set up using different methods that you’re going to measure and keep in pocket for Q4. Your timeline should include your campaign strategies, when to initiate them, and through what means. Fear not if you didn’t start early enough to do some good old-fashioned A/B testing. There is another way to measure consumer patterns while also being able to reap in the holiday shopping season benefits – bandit algorithms. “Instead of running a controlled experiment in which traffic is divided equally over the course of the test and then everything is allocated to the winner at the end, bandits work in real time to shift traffic towards the winning variation. People refer to this as ‘earning while you learn,’” (Big Commerce). Holiday shopping is different than regular shopping. Generally, people who are shopping for the holidays know what they’re looking for, or have an idea of it. Holiday shoppers also tend to make purchasing decisions quicker if the item is a fair price. This means that your direct marketing campaign has to grab people’s attention right from the get-go. A good way to do that is through smart campaign strategies. First and foremost, regardless of what your offer is, your creative piece of direct mail should be festive. It’s true that everyone is awaiting direct mail pieces with coupons, deals, and featured items; but you still want to make sure your piece of DM stands out from the rest. Along with festive designs and graphics, you could also change the paper size, the paper style, and even switch up the type of direct mail piece based on segmentation tests that you did throughout the year. Although more direct mail pieces get read during the holiday season, it’s still important to be transparent with your offer. Being the volume of direct mail pieces increases dramatically during Q4, you want the potential customer to be able to see your offer quickly among the others. It’s good to be creative within your copy, but make sure your headlines clearly display the offer itself (InStoreMag). Campaigns that are sure to always get a response are campaigns that reward loyal customers. Customers want to feel special and feel like their contributions to the company didn’t go unnoticed. So a good idea is to host an event where only loyal customers are invited at a specific time to receive a discount and shop in a less chaotic atmosphere. Customers are enticed by this because they feel like they’re a step ahead of everyone else. For example, retailer Brooks Brothers sends out “private event” direct mail pieces to help shoppers save both time and money; avoiding the bedlam of holiday shopping and instead, attending a more intimate setting to shop and save. To be able to give during the holidays to people who aren’t as well off is a very humbling thing to do. It fills so many hearts with merriment and cheer. However, being people are so busy running around trying to finish shopping and planning their big dinner – they oftentimes forget to donate or just don’t know where to bring their donation. The solution? Make it known (and visible) hat X amount of your total purchase will go to X charity. Customers are always looking for ways to justify the amount of money they just spent on gifts, and what better way than knowing their purchases went towards a charity? Customers also like to know that your company is socially aware, and this will subconsciously stick with them even after the holidays. Therefore, if you plan on working with charities, make sure you advertise this on your direct mail piece as well. Another incentive to generate a greater response is to advertise on your direct mail piece that they could get a free gift with their purchase of X amount or more. The idea of a free gift during the holiday season is an automatic driving point. Whether or not they like what the free gift is, it shows that you value the customers, want to reward them for shopping with you, and are trying to make their life easier with a free gift. Instead of a free gift, you could also do a gift card – which might be more appreciated. 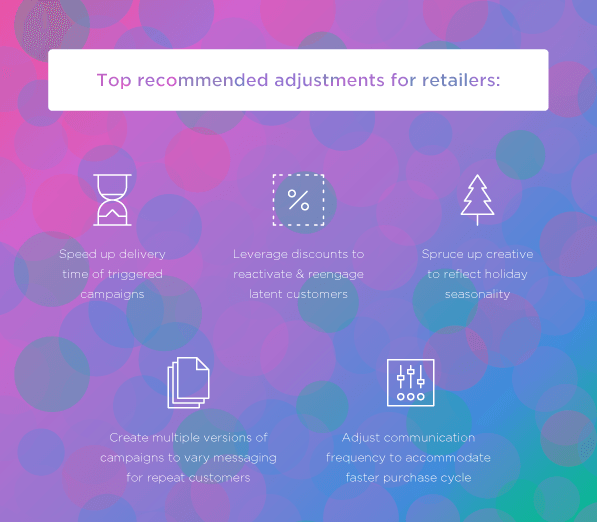 Creating a holistic marketing approach is especially important throughout the holiday season, where buyer intent is much more clear and discretionary spending is ramped considerably. Therefore, blending both direct and digital channels is a surefire way to capitalize on this increase; moving prospects further down your marketing and sales funnel and increasing awareness through holiday-themed branding. 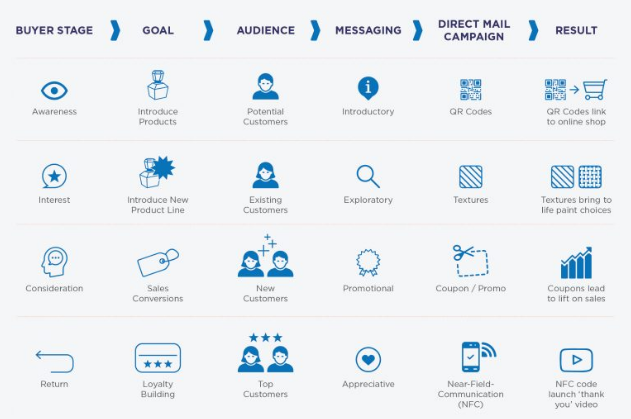 Sending targeted email campaigns (both offer-based and content-based) are a great addition to your data-driven direct mail campaign. For one, aligning imagery and copy in an email can be a great way to help consumers gain subconscious familiarity with your brand prior to a DM run. 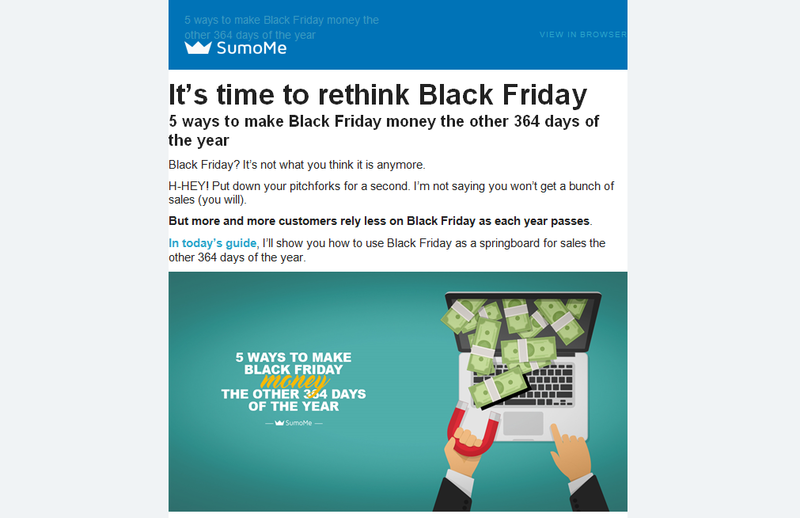 From a content level, releasing insightful and helpful articles on themes pertaining to your industry or how to navigate your holiday season can be a light “touch” and help increase awareness (see SumoMe’s most recent campaign below). Even better, testing an email campaign prior to a direct mail run is one of the most cost effective ways for seeing which copy and imagery is converting the best. In the world of paid, Google AdWords and Facebook Ads devour the online space; accounting for 85 cents of every dollar spent. Instead of fighting the inevitable, ensuring that you are running optimized AdWords and Facebook Ad campaigns (aligned with your direct mail creative) will help increase your reach across the digital spectrum and help capture more customers than DM alone. 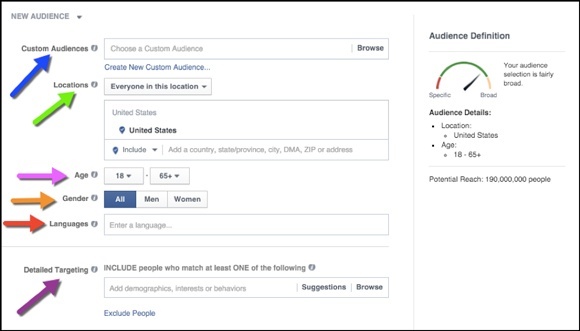 Platforms like Facebook are especially powerful throughout the holidays, where targeting can be drilled down to the interest level; allowing you to immediately capture those listing your brand, as well as the themes surrounding it. Generating holiday buzz should be something you prepare for. It’s important to have a timeline ready to go by no later than Q3 of all your marketing plans. 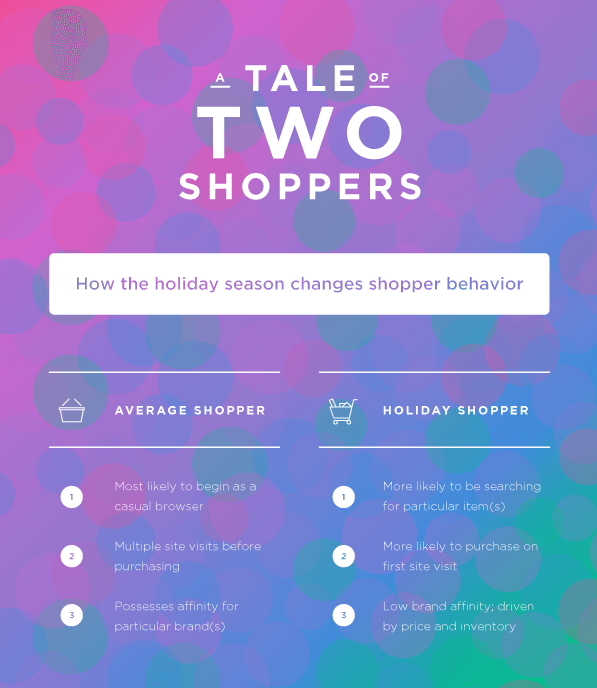 Holiday shoppers have different behaviors compared to regular season shoppers. Being more offer-driven than brand-driven will help you remain competitive in this season. 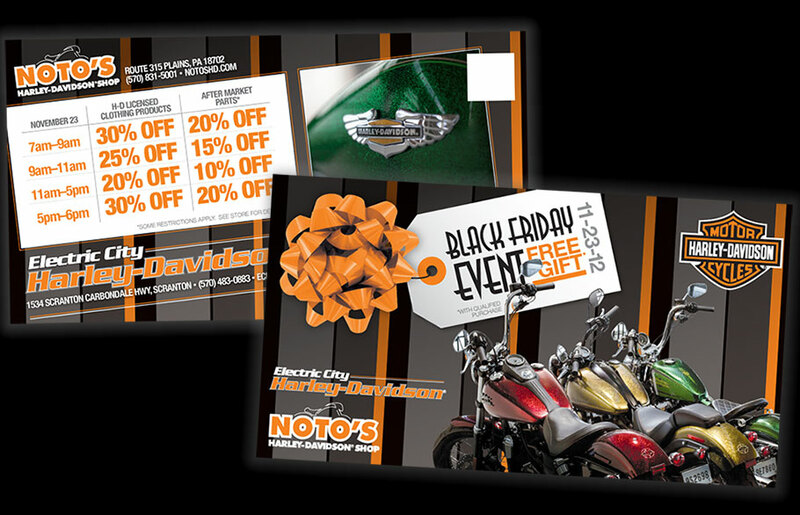 Make your direct mail pieces festive and fun, and offer special incentives that customers don’t normally receive during the year. Think about the frequency and reach of each piece, and decide which you want to lean toward. Integrate your direct and digital strategies for increased response, engagement and ultimate, sales.